i.MX RT1064 Evaluation Kit (MIMXRT1064-EVK). The following article explains all necessary steps to create an Embedded Wizard UI application suitable for the i.MX RT1064 Evaluation Kit (MIMXRT1064-EVK). Please follow these instructions carefully and step by step in order to ensure that you will get everything up and running on your target. In case you are not familiar with Embedded Wizard, please read first the Quick Tour tutorial to understand the principles of Embedded Wizard and the GUI development workflow. If you want to use the Free edition of Embedded Wizard Studio and the iMX_RT Platform Package, please register on our website and select the target IMXRT1064-EVK. Then you can download the above software packages. All customers who licensed Embedded Wizard can visit our download center to get the above software packages. 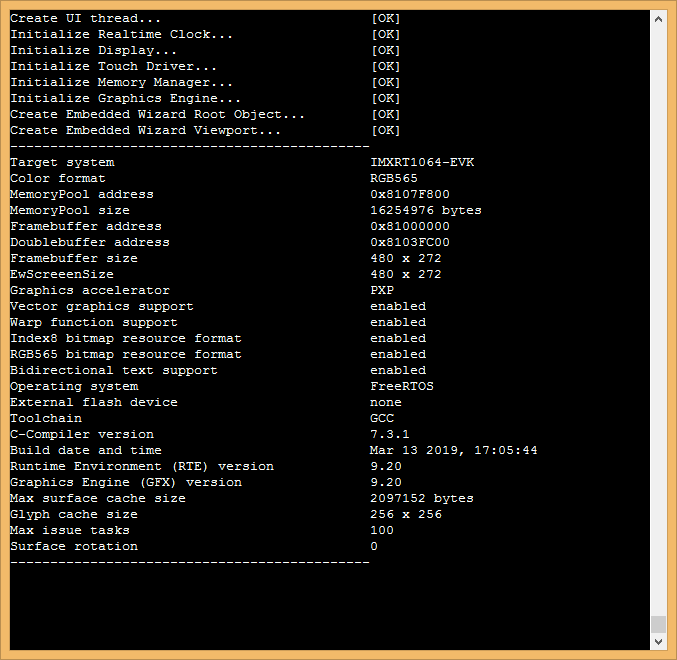 ★Step 1: Install the latest version of Embedded Wizard Studio. ★Step 2: Install the Embedded Wizard iMX_RT Platform Package. ★Step 3: Connect your development board with your PC via USB port J28. ★Step 4: Unpack the provided Embedded Wizard Build Environment for IMXRT1064-EVK to your local file system (e.g. C:\NXP\IMXRT1064-EVK). 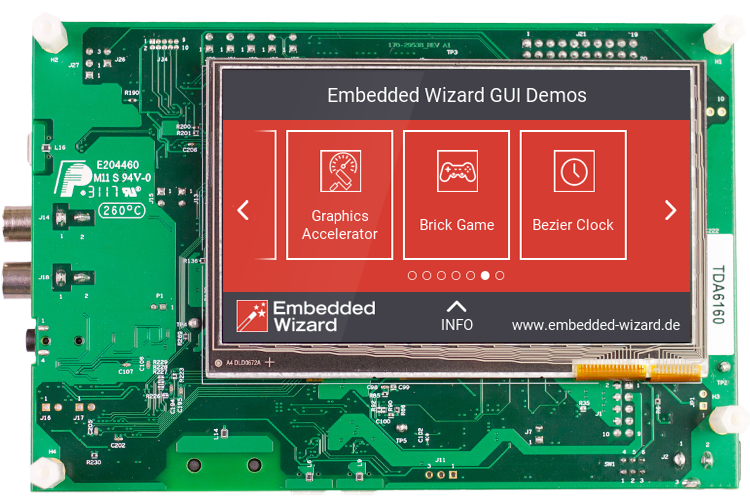 If you just want to run our GUI demos on your MIMXRT1064-EVK development board without building the different examples, you can simply flash the binary file of the Embedded Wizard Master Demo. The Embedded Wizard Master Demo combines a variety of examples within one huge demo application. It can be used for presentations and showcases. Each demo application can be activated from a common main menu. To return back from a demo application to the main menu, a small home button appears on top of every demo. Additionally, the Master Demo contains an auto-demo mode that presents one demo application after the other. The auto-demo starts automatically and stops as soon as the user touches the screen. ★Connect your development board with your PC via USB (make sure to use the USB Debug Link connector) and remove jumper JP5 from the board. Otherwise flashing your software is not possible. ★Execute the batch file FlashMasterDemo.bat that you will find in the subdirectory \MasterDemo. A console window will appear and the flash tool will download the binary file of the Master Demo. 'Master Demo' running on MIMXRT1064-EVK development board. •StartGccBuildEnvironment.bat - This script file is provided to start a windows command line to build your GUI applications for the target. •\Application - This folder contains ready-to-use projects to compile and link an Embedded Wizard generated UI application. They are used for all provided examples and they can be used to build your own UI applications. •\GeneratedCode - This folder is used to receive the generated code from an Embedded Wizard UI project. All template projects are building the UI application out of this folder. You can create your own UI project and generate the code into the subdirectory \GeneratedCode without the need to adapt the project. •\Project - This folder contains the prepared projects for GCC (make), IAR Embedded Workbench, Keil MDK-ARM and NXP MCUXpresso IDE. •\Source - This folder contains the files main.c and ewmain.c. There you will find the initialization of the system and the main loop to drive an Embedded Wizard GUI application. Additionally, this folder contains a configuration file for FreeRTOS and the device driver C/H files used for the DeviceIntegration example. •\HelloWorld - A very simple project that is useful as starting point and to verify that the entire toolchain, your installation and your board is properly working. •\ColorFormats - This project demonstrates that every UI application can be generated for different color formats: RGBA8888, RGB888, RGB565, Index8 and LumA44. •\ScreenOrientation - This demo shows, that the orientation of the UI application is independent from the physical orientation of the display. •\DeviceIntegration - This example shows the integration of devices into a UI application and addresses typical questions: How to start a certain action on the target? How to get data from a device? •\GraphicsAccelerator - This application demonstrates the graphics performance of the target by using sets of basic drawing operations that are executed permanently and continuously. •\BezierClock - The sample application BezierClock implements a fancy digital clock and timer application with animated digits. The application uses vector graphics to render dynamically the different digits for clock and timer. The change from one digit to another is handled by moving the vector points to get a smooth transition animation. •\BrickGame - The sample application BrickGame implements a classic "paddle and ball" game. In the game, a couple of brick rows are arranged in the upper part of the screen. A ball travels across the screen, bouncing off the top and side walls of the screen. When a brick is hit, the ball bounces away and the brick is destroyed. The player has a movable paddle to bounce the ball upward, keeping it in play. •\ClimateCabinet - The ClimateCabinet demo shows the implementation of a control panel for a climatic exposure test cabinet. The user can define a heating time, a nominal temperature and humidity, a dwell time and the final cooling time. •\PaperCutter - This demo shows the implementation of a paper cutting machine, where the user can define the pagination and format of the paper as well as the cutting speed and the amount of papers. The application contains many rect effects and fade-in/fade-out effects to change dynamically the layout of the screen. •\WashingMachine - This demo shows the implementation of a washing machine with a couple of fancy scrollable list widgets to choose the washing program and parameters. The speciality of this sample application is the magnification effect of the centered list items and the soft fade-in/fade-out effects. •\WaveformGenerator - This WaveformGenerator demo application combines waveforms with different amplitudes and frequencies. The implementation shows the usage of the class Charts::Graph to paint a list of coordinates. •\MasterDemo - This folder contains the binary file of the Embedded Wizard Master Demo application and a script file to flash the demo on your target. The Master Demo combines a variety of examples within one huge demo application. It can be used for presentations and showcases. •\PlatformPackage - This folder contains the necessary source codes and/or libraries of the iMX_RT Platform Package: Several Graphics Engines for the different color formats (RGBA8888, RGB888, RGB565, Index8 and LumA44) and the Runtime Environment (in the subdirectory \RTE). •\TargetSpecific - This folder contains all configuration files and platform specific source codes. The different ew_bsp_xxx files implement the bridge between the Embedded Wizard UI application and the underlying board support package (NXP hardware drivers) in order to access the display, the serial interface and the clock. •\gcc-arm-none-eabi - This folder contains a subset of the GCC ARM embedded toolchain to compile the examples. •\Make - This folder contains a make tool to build the entire GUI application via command line. •\MCUXpressoIDE - This folder contains the necessary drivers to flash the binaries. •\MCUXpressoSDK - This folder contains the necessary subset of the Software Development Kit (SDK) for MIMXRT1064-EVK used for the Embedded Wizard UI applications (BSP, drivers, FreeRTOS). •\TLSF - This folder contains the memory manager used for the Embedded Wizard UI applications. Example 'HelloWorld' within Embedded Wizard Studio. ★Navigate to the directory \Example\HelloWorld. ★Open the project file HelloWorld.ewp with your previously installed Embedded Wizard Studio. The entire project is well documented inline. You can run the UI application within the Prototyper by pressing Ctrl+F5. ★To start the code generator, select the menu items Build➤Build this profile - or simply press F8. Embedded Wizard Studio generates now the sources files of the example project into the directory \Application\GeneratedCode. ★Navigate to the top level of the Build Environment. ★Open StartGccBuildEnvironment.bat - as a result, a windows command line window should open. In case there are error messages, please edit the file and double-check the path settings. If everything works as expected, the application is now executed on your MIMXRT1064-EVK target. Example 'HelloWorld' running on MIMXRT1064-EVK development board. ★The attribute PlatformPackage should refer to an installed iMX_RT Platform Package. ★The attribute ScreenSize should correspond to the display size of the MIMXRT1064-EVK development board. ★The attributes FormatOfBitmapResources and FormatOfStringConstants can be set to DirectAccess in case that the resources should be taken directly from flash memory. By default these attributes are set to Compressed. ★The attribute OutputDirectory should refer to the \Application\GeneratedCode directory within your Build Environment. By using this template, it will be very easy to build the UI project for your target. ★The attribute CleanOutputDirectories should be set to true to ensure that unused source code within the output directory \Application\GeneratedCode will be deleted. Now you can use the template project in the same manner as it was used for the provided examples to compile, link and flash the binary. ★Start the batch file 'StartGccBuildEnvironment.bat'. Again, a windows command line window should open. Most of the project settings are taken directly out of the generated code, like the color format or the screen orientation. Only a few additional settings can be configured directly within the Makefile, like the usage of the FreeRTOS operating system. In order to receive error messages or to display simple debug or trace messages from your Embedded Wizard UI application, a serial terminal like 'Putty' or 'TeraTerm' should be used. ★As soon as you connect your MIMXRT1064-EVK target with the PC via USB, a new virtual Com Port appears within your system device list. Open the device manager to get the port number of this COM port. This terminal connection can be used for all trace statements from your Embedded Wizard UI applications or for all debug messages from your C code. The subdirectory \Application\Project\EWARM contains a template project that is commonly used for all provided Embedded Wizard examples. All Embedded Wizard examples will store the generated code within the common /Application/GeneratedCode folder. The generated code of an Embedded Wizard example is imported automatically to the IAR Embedded Workbench project using the Project Connection mechanism. 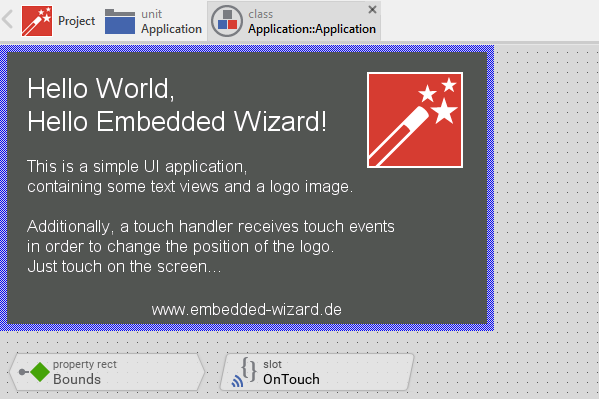 ★Open the desired Embedded Wizard example project. ★Select the Profile and set the attribute PostProcess to the file ..\..\Application\Project\EWARM\EWARM_ew_post_process.cmd. After the Embedded Wizard code generation the installed post process will generate a ewfiles.ipcf file, that controls the import to the IAR Embedded Workbench project. 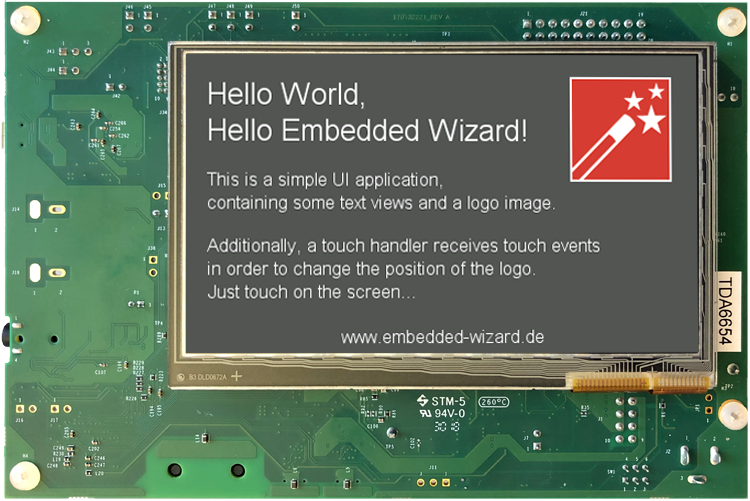 After returning to IAR Embedded Workbench, the latest generated code and the suitable Embedded Wizard Platform Package will be imported to the IAR Embedded Workbench project (depending on the color format and the screen orientation selected in the Embedded Wizard Profile). If the color format or the screen orientation was changed, please do a complete rebuild of the IAR Embedded Workbench project. The subdirectory \Application\Project\MDK-ARM contains a template project that is commonly used for all provided Embedded Wizard examples. All Embedded Wizard examples will store the generated code within the common /Application/GeneratedCode folder. The generated code of an Embedded Wizard example is imported automatically to the Keil MDK-ARM project using the CMSIS PACK mechanism. ★Install Tara.Embedded_Wizard_Launcher.x.x.x.pack by double clicking. You will find the file within the subdirectory \Application\Project\MDK-ARM. ★Select the Profile and set the attribute PostProcess to the file ..\..\Application\Project\MDK-ARM\MDK-ARM_ew_post_process.cmd. After the Embedded Wizard code generation the installed post process will generate a ewfiles.gpdsc file, that controls the Keil MDK-ARM project import. In Keil MDK-ARM a dialog appears: "For the current project new generated code is available for import". After confirmation, the latest generated code and the suitable Embedded Wizard Platform Package will be imported to the Keil MDK-ARM project (depending on the color format and the screen orientation selected in the Embedded Wizard Profile). If the color format or the screen orientation was changed, please do a complete rebuild of the Keil MDK-ARM project. The subdirectory \Application\Project\MCUXpresso contains a template project that is commonly used for all provided Embedded Wizard examples. All Embedded Wizard examples will store the generated code within the common /Application/GeneratedCode folder. ★Select the Profile and set the attribute PostProcess to the file ..\..\Application\Project\MCUXpresso\IMXRT1064-EVK\MCUXpresso_ew_post_process.cmd. After the Embedded Wizard code generation the installed post process will adapt the .cproject XML file. All necessary libraries and include paths (depending on the color format and screen rotation) will be set automatically. ★Open NXP MCUXpresso IDE and select the directory \Application\Project\MCUXpresso as workspace directory. ★To import the C project, select the menu item File➤Import and choose General - Existing Projects into Workspace and press Next. ★Choose Select root directory - Browse and select the directory \Application\Project\MCUXpresso\IMXRT1064-EVK. ★To compile the project select Project➤Build Project. ★Choose the GUI Flash Tool for running the application on the target or use the build in debug function for debugging the application on your target. 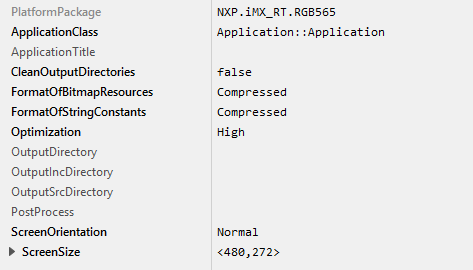 If the color format or the screen orientation was changed, please do a clean in NXP MCUXpresso IDE. ★System clock (ew_bsp_system.c) - The first and the important step is to configure the system and peripheral clock. Depending on your hardware you can use the internal or external clock as source. Please take care that your USART and I2C are connected to the selected clock source and configured correctly. The Embedded Wizard UI application runs independent from the chosen system frequency, however, with a slow system clock, all components need more time for their tasks (e.g. display refresh). ★SDRAM (ew_bsp_system.c) - The SDRAM configuration has to be adapted to your particular SDRAM. Please use a memory test to ensure that writing and reading works properly. If the start address and/or the size of the SDRAM has changed, please adapt the settings for the framebuffer and the memory pool within the file ewmain.c. ★MPU (ew_bsp_system.c) - Please take care to configure the MPU properly in order to avoid unexpected speculative read accesses outside of valid memory regions. ★USART (ew_bsp_serial.c) - Typically, the USART configuration just requires a new pinout according your hardware layout. The usage of the serial connection is highly recommended in order to get status and debug messages during runtime. In case of using a NXP BSP it is possible to use the preconfigured debug console. 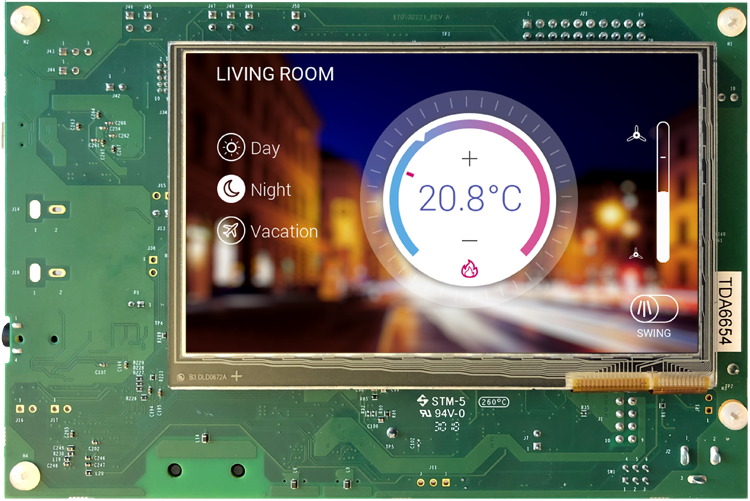 ★eLCDIF (ew_bsp_display.c) - The eLCDIF is an integrate display controller which allows you to connect many different display types to a NXP device. Here you have to adjust the interface to your display. It is important to adjust, polarity, timings, color format and layer settings according your dedicated display. ★Pinout (Drivers/pin_mux.c) - To configure the pinout of your custom hardware you need adapt the pin routing. All the information how the UI relevant hardware is connected to your MCU is configured centrally in one file. ★Touch (ew_bsp_touch.c) - If your application requires touch support, you can integrate a given touch driver provided by the touch controller manufacturer or write your own. As a result the current touch position should be returned. As soon as these steps are done, you can create your own GUI application or use one of the provided examples. If the size of your display is different compared to the display of the MIMXRT1064-EVK development board (480x272 pixel), please adapt the attribute ScreenSize of the UI project and the size of the framebuffer within the file ewmain.c accordingly. Please select your Embedded Wizard version. By default, the latest version 9.20 of the documentation is presented.